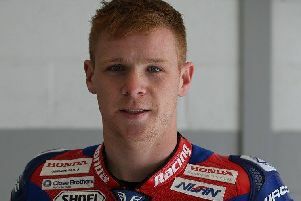 Australian rider Jason O’Halloran rode to a strong sixth place in the first British Superbike race at Oulton Park. But the Market Rasen-based rider was unlucky to crash out of fourth place in the second race while in a battle for the podium. O’Halloran was strong throughout free practice on the Honda Racing Fireblade and qualified for a fourth-row start to the first race, run in difficult conditions in the rain. But the poor track conditions didn’t faze O’Halloran and he got a clean start up into fourth place on the first lap. He passed Brad Ray on lap two and settled into third place, but was gradually reeled in by the group behind him, and with three laps to go Leon Haslam managed to make a pass stick. On the final lap he was chased hard by Andrew Irwin and Michael Laverty, and the pair managed to get the pass on him as they approached the chequered flag, with O’Halloran finishing in sixth place. Starting the second race from the second row, the weather had changed and the track had become almost dry. O’Halloran got a great start and jumped straight up into second place, but there was a queue of four riders right behind him waiting for a chance to pass. He held his line for six laps, but Haslam demoted him to third on lap seven, and Tom Bridewell then passed him on lap 11. But the Australian was still in a position to fight his way back up into a podium position until the front end folded under him and he crashed at Old Hall on lap 13, his race over. O’Halloran is out of the end-of-season showdown for the title, but could still finish the season in seventh place and holds the position with a seven-point advantage over Tarran Mackenzie. The penultimate round of the British Superbike championship is at Assen, in the Netherlands, over the weekend of September 28 to 30.